It has been a lot of fun painting the Dark Sword miniatures for tutorial videos, since they are packed with a lot of fine details which show up on camera quite nicely! I've been working hard to get a second "palette camera" in place, and this was the first video where I tested it! That worked out pretty well, and I have made more modifications to it since. Now, the figure is in a more natural painting position for me, and it takes up a far larger portion of the screen. Since I am using XSplit to record the videos, I can change the size of the palette screen when necessary, right as I am recording! That is very cool! For this episode, I was working with the Reaper Clear and Liner paints, doing a number of glazes. For the second Dark Sword painting episode, I will do the same figure in oil paints. I want to do this each month, because I think it could really provide some additional perspective on both mediums. People can't tell which of my figures are painted in oils or acrylics when they look at them. Heck, most of the time I can't even remember myself! It really has more to do with time saving and efficiency. 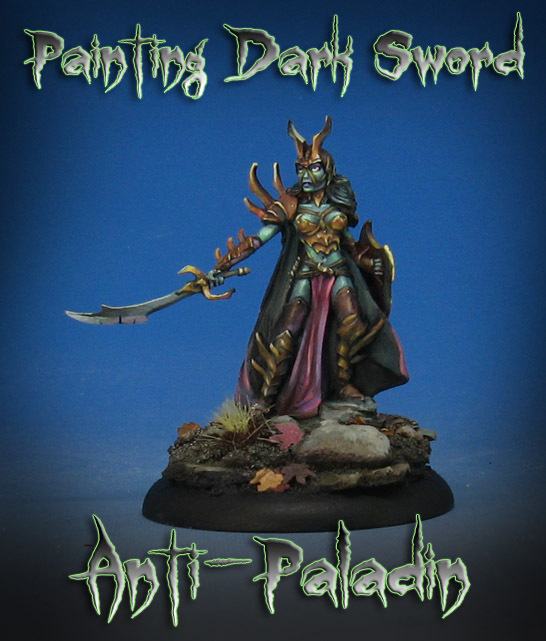 The Dark Sword pledge is $10, but there are also a few other levels available. These offer "hard copy" versions of the videos on USB drive, and even the miniatures themselves! !